In part 1 of this series on wastewater and water treatment mixers, we discussed how to select a waste water mixer for chemical preparation. 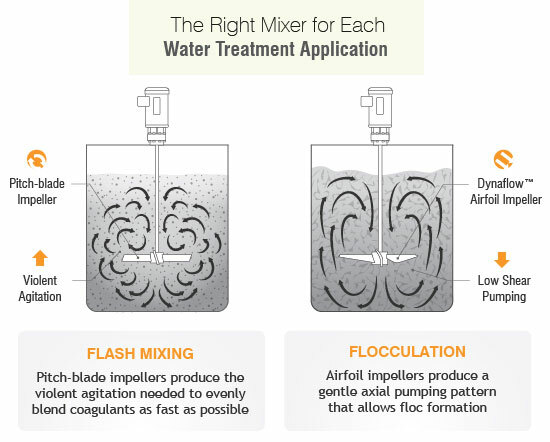 In this post, we’ll show you how to select a Waste Water Mixer for flash mixing and flocculation. Impeller – For high speed, high shear mixing, your best bet are pitch-blade impellers. They create a turbulent fluid flow that allows solids to collide and shear. For our clients, we recommend the P4 Pitch impeller blade and customize the size and diameter to their process. High G Value – Because the residence time in flash mixing is short (less than 60 seconds), the mixer needs to be configured with a high G value / velocity gradient (400 – 1000 sec-1). This has to be calculated by your mixing team: at Dynamix, we may vary this value to ensure proper dispersion. Tank Configuration – While not actually part of the mixer, tweaking the tank configuration can minimize short circuiting. To maximize particle contact, we recommend flowing in from the bottom and the flowing out from the top. Impeller Shape & Size – For low speed, low shear mixing, your best bet are large airfoil impellers. They create laminar fluid flow over large areas of influence that protect the integrity of the solids. 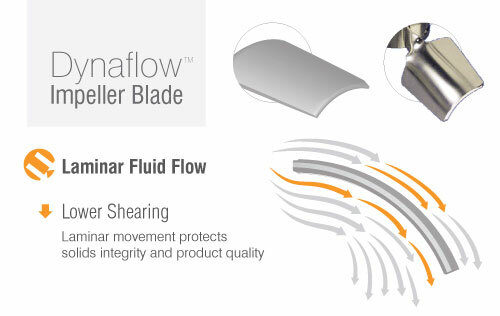 For our clients, we recommend Dynaflow™ blades with an impeller diameter-to-tank ratio of 0.3 – 0.45. Impeller Tip Speed – Another way to minimize shear is to manage the impeller tip speed. As with G values, determining the appropriate tip speed is dependent on your specific process. In general, we recommend a maximum tip speed of 480 feet/min for our Dynaflow™ impellers. Low G Value – Because the residence time for flocculation is considerable longer than flash mixing (>30mins), the mixer needs to be configured with a low G value (20 – 100 sec-1). Despite the low G values needed for flocculation, it’s still advisable to add an additional 15% on top of the calculated G value to ensure sufficient power. As you can see, flash mixing and flocculation require very different mixing solutions. If you’re interested in learning more about mixing solutions for your process, post a comment or email us at [email protected]. The article is very useful. We are constructing a Flash mixer and Flocculation tanks for inclined plate clarifier. We request your expertise in building the right size tanks for efficient flocculation. We have the silt/mud water with flow rate of 200GPM. Please suggest the Flash tank size and the mixing speed in terms of motor RPM. Also, the dimensions of Flocculation tank size and the motor speed in terms of RPM. The tank diameter to height needs to be considered. Ideally the tank diameter and height for a cylindrical tank should be relatively the same. Once the height to diameter ratio is above 1.5, an added impeller will be needed in order to create proper pumping throughout the tank. Alternatively, if the tank is rectangular, tank baffles will not be needed as a rectangular tank is self-baffling. The important parameter in a rectangular tank would to keep the length to width ratio within 1.5 otherwise two mixers will be required to provide proper pumping. Therefore, there are several tank dimensions that work, just make sure to avoid a tall and skinny cylindrical tank and a long rectangular tank as that is not ideal for mixers price wise. In order to size the mixers correctly for the flash mixer please take a look at my comment in http://www.dynamixinc.com/wastewater-treatment-mixers-part-1 . It will highlight the important factors including overall volume of the tank which is needed. we are asked to design a flash mixer for 7 meter square tank with 5.2 meter liquid depth, for which we need to calculate power and rpm of mixer and also we need to know diameter of impeller, fluid used being sewage water and suggested power/rpm from consultant as 60 HP with 150 rpm, any help regarding this query is highly appreciable. Velocity gradient for the process. If a velocity gradient is not available we will need the design flow for this process and then we will determine the velocity gradient from this parameter. Maximum and minimum process temperature in order to do a proper mixer selection. Based on the above two parameters, and the information that you’ve already provided, the mixer horsepower will be determined. Therefore, there is not enough information in your request to validate the selection. But based on the evaluation of the tank dimensions, motor hp & speed, the mixer suggested by the consultant is not sized properly. If we assume that 60HP is correct for this tank, the mixer impeller diameter will be in the 78” to 124” range and the mixer speed in order to have a 60 HP output would be a maximum of 53 rpm & 24 rpm respectively. 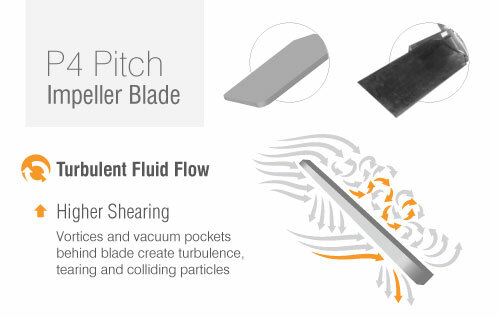 The impeller type that’s generally used for flash mixing is a pitched-bladed impeller and my suggestions were based on the assumption that these types of blades will be used for the application. If I’m constructing one tank for both coagulation and flocculation, what will be the best Impellers to use? We would recommend our Dynaflow impellers, as this will maximize mixing level while minimizing HP requirements and floc deformation. any idea about it’s design ? Hello Ahmed, we would need more information about your application in order to make a recommendation. Please call one of our Application Engineers, they will be happy to assist you.